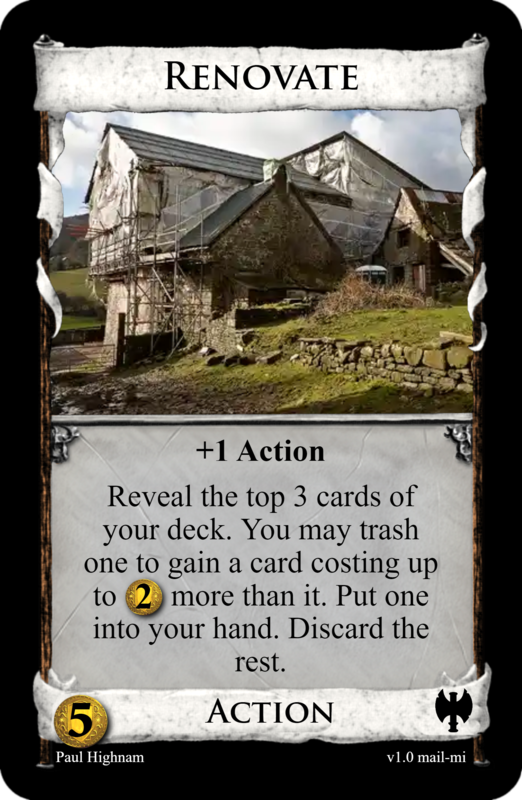 you want to replace one of Asper's cards ? Still a Fool replacement. And a Harlequin/Mime/Mine mashup. You are welcome. AND it's sort of like Jester! This is very close to useless if there's no way to get more than 3 Action cards in play, generally giving you no net benefit. 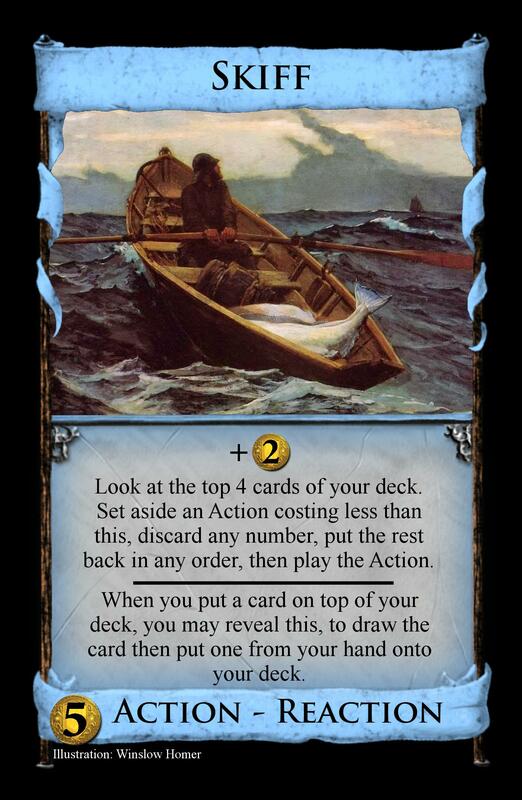 Lots of cards are bad when an engine isn't possible, but not as bad as this. Meant to replace mint in prosperity. 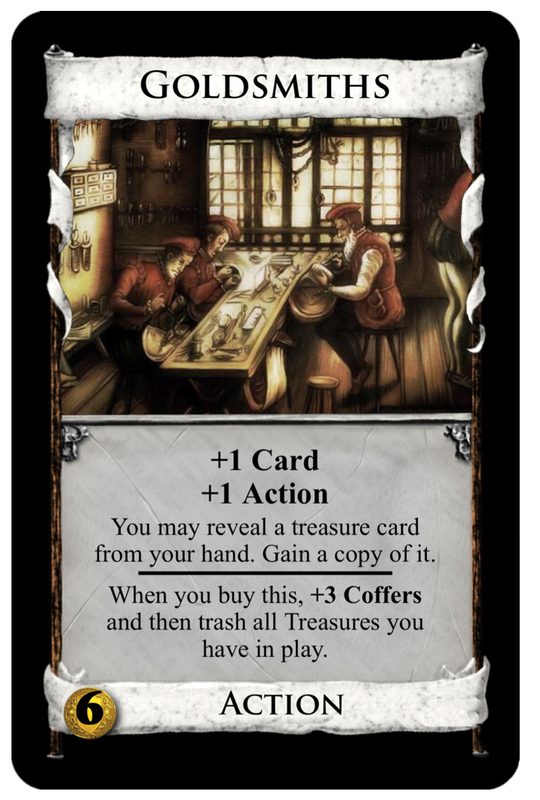 I put coffers in the card, since there is technically no coffers in prosperity I could change it to +1 Buy + $3. So that you could buy a Silver after you lost all your treasure cards. Here is my take to replace Pirate Ship. I hope it is different enough from Privateer. 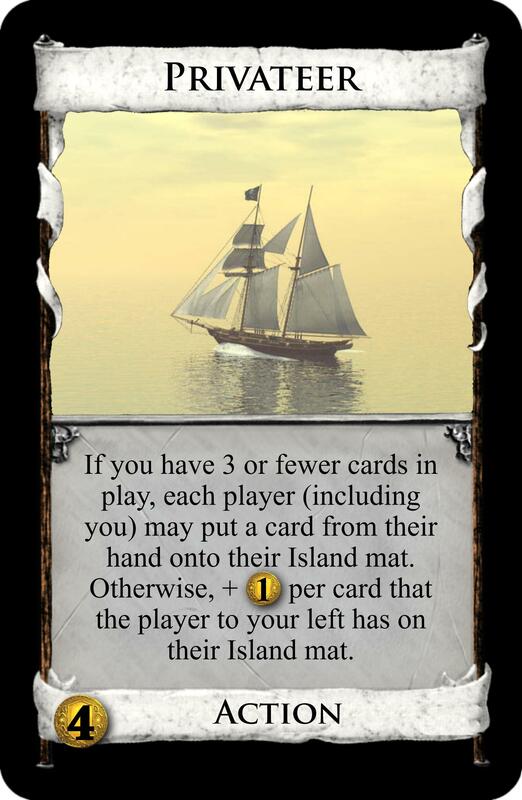 It also replaces the need for coin tokens and uses the big nice mat for cards instead. As a duration, it fits nicely into Seaside. 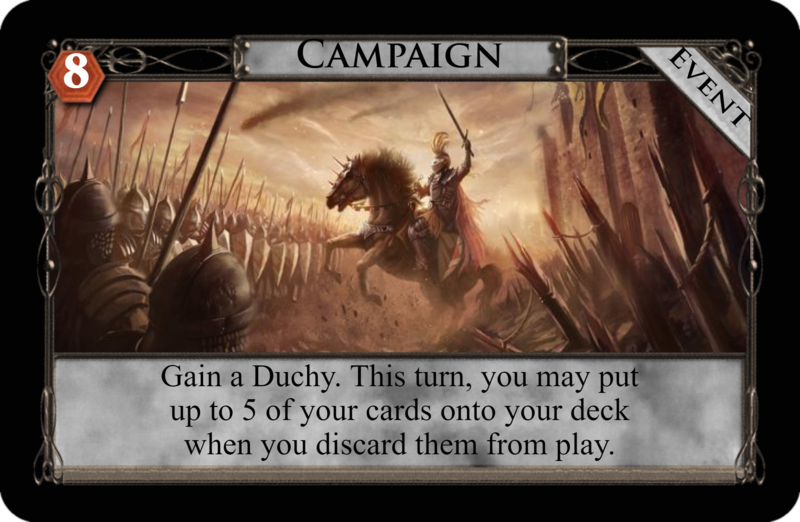 Edit: Changed the wording to "any or all", to make clear it's possible to save cards on the mat for future turns. 4. Countries that remove their Lookouts will have more Shipwrecks, and be Embargoed for Trashing their cargo! Buying at no cost would be simply gaining. But apart from that, I love the idea to let other players place your Adventures tokens. So much interesting potential there! 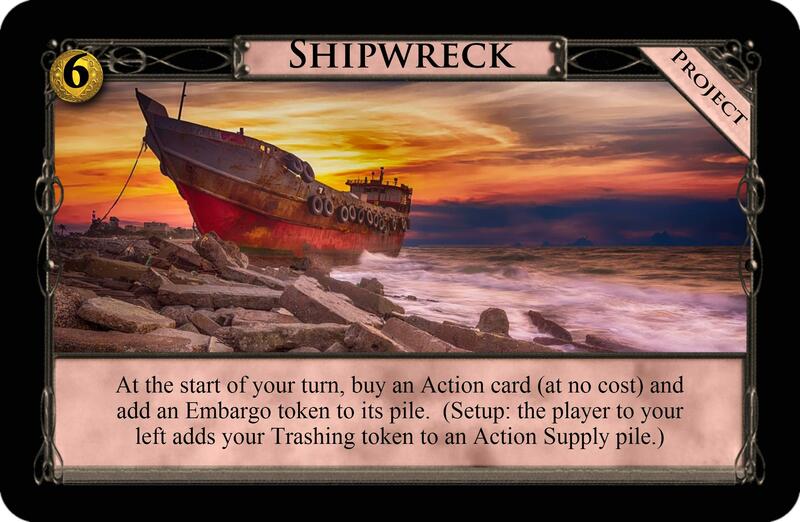 I think the intent is to trigger on-buy effects, such as the Trashing token which is on-buy not on-gain. However, I find it a very clunky workaround. Oh sure, sorry - missed that interaction. 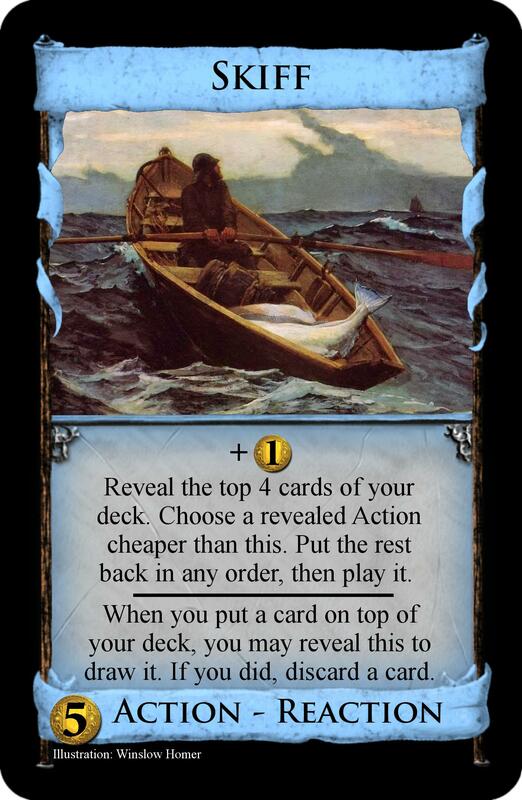 I feel I need to say that the intent of the contest was that cards could be printed in the expansion they're designed for, so Coffers in Prosperity or Projects in Seaside don't really fit in the spirit of the challenge as those expansions don't use those mechanics. Replacement for Duchess. Also gives Hinterlands a Workshop variant. 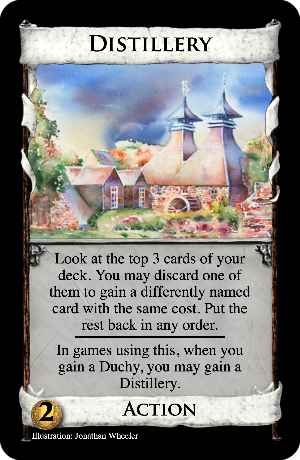 EDIT: Changed to fit more with Duchess's sifting theme. 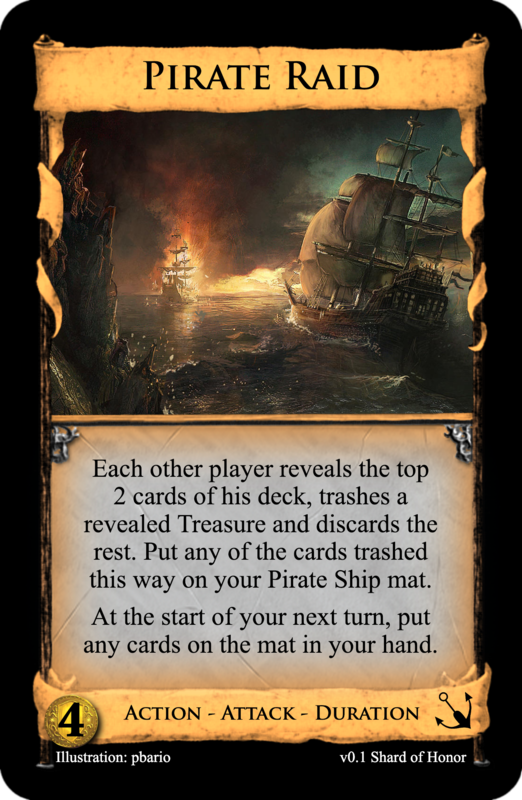 Ommited the second naming of Pirate Ship mat to save at least a few words. It should be clear. Luckily, nobody forces us to throw away those replaced cards. For instance, I still like to play with Thief sometimes. Especially, if there are many Treasures in the Kingdom. This is to replace Navigator. You can discard or put back the cards you look at, and it's non-terminal in a niche, hopefully interesting kind of way. And a complimentary reaction that might interact with too many things in Seaside. Tried a few wording shortcuts to make things less wordy, but is it understandable? I think Lighthouse was supposed to be Seaside's "Reaction". Still, I like this. It also gives Seaside a Throne variant, which is neat. To reduce the confusion, I'd maybe replace "costing less than this" with "non-Skiff"? I might tweak the Reaction part a bit, though. The wordiness is a problem, but it also doesn't help much against Sea Hag... and doesn't help at all against Ghost Ship! 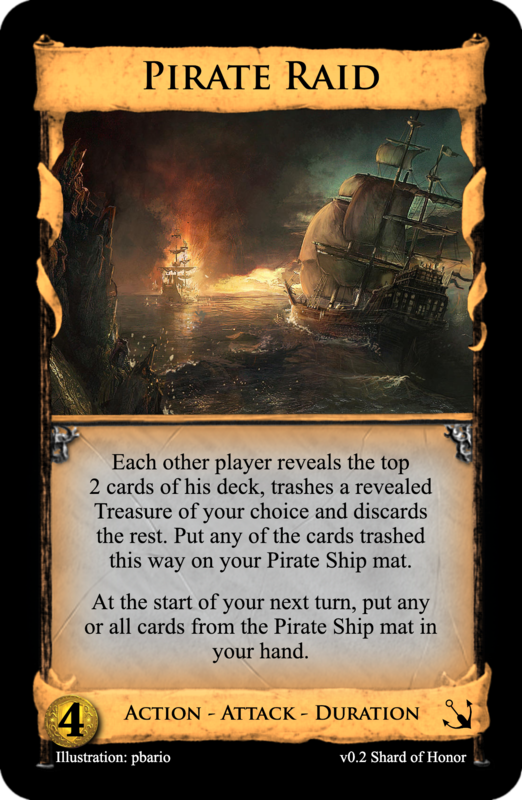 With that said (I like pirate ship too) even though you can still play with the old cards like thief. 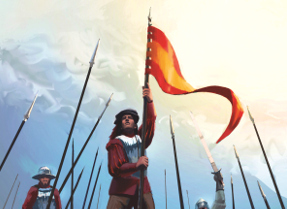 Noble brigand is ten times better than thief, you can play it when you buy it, and then it can even give out coppers! of course i play with old cards too; didn't you see my ? While the new name isn't a pun, I think the theme now hits a much better sweet spot between Jester, Lucky coin, and gaining Treasures by chance. It's a shame the pic isn't great, but if we are being honest, the original wasn't much better. As Lucky Coin is the only part of Fool I care about, it seemed a good idea to make that connection feel worthwile. Cheers. You smartly prevented a mono-card-strategy but I still wonder whether this is too strong/cheap. Beyond the sifting and the Reaction this is a double Peddler and unlike Herald and Vassal it virtually never misses if you manage to put enough <$5 Actions into your deck. Cheap Actions are a thing in Seaside, so I thought I'd tie that in. Thanks for making the interactions with the attacks clear, though, I've changed the reaction to discard a card rather than put one back. It just lessens the impact of the two attacks so Lighthouse is still useful, as well as having other uses like turning Pearl Diver into Fugitive. Yeah, with the reaction adding a bit of value as well, and the ability to play an Action not from hand whilst knowing a bit about the top of your deck as well, it's a strong package. Knocked the +$ down to 1. Intended to replace Trader. 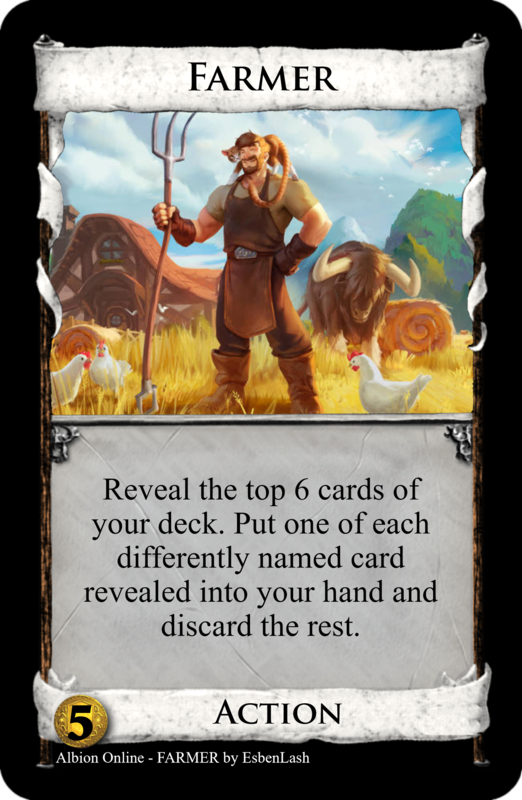 Hinterlands doesn't need two cards that replace junk with Silver, and "would-gain" causes lots of rules headaches. My initial idea was for a card that trashes from the discard pile which you could play from your hand (like Caravan Guard) in reaction to an attack. There are timing issues with that though so I decided that giving you +1 Action on your next turn is close enough. Adding discard from hand ameliorates the swinginess factor of finding it T3 vs T4. 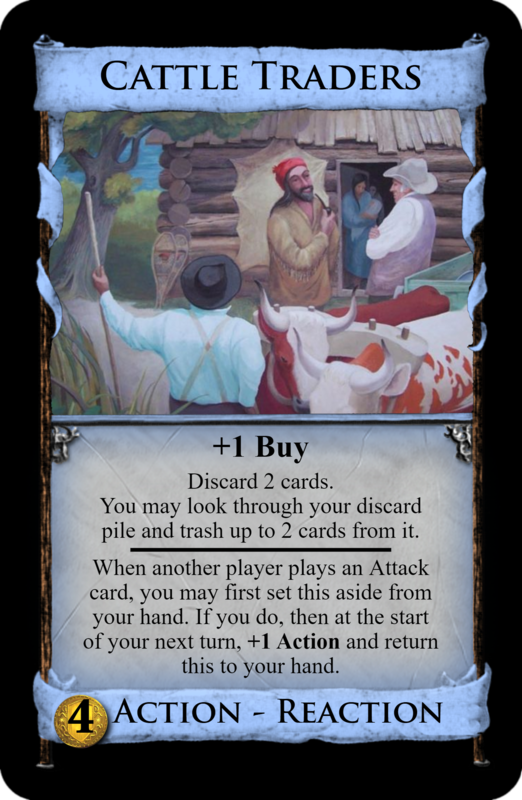 At this point I'm left with something with lots of parallels to Horse Traders so I may as well tack on a +Buy. Once you're done trashing, it can be an even worse Ruined Market, which I think is kind of fun.